This video explains just how much of a tidal surge was produced by Hurricane Sandy in 2012 and how one Architect helped a building owner avoid disaster using sustainable design. Green building and sustainability both have their parts to play in unfortunate natural disasters - this is proof. Trane, a leading global provider of indoor comfort solutions and services and a brand of Ingersoll Rand, introduces the newest addition to its air-cooled chiller product portfolio, the Trane Stealth™ air-cooled chiller. Available in the 150-300 ton capacity range, Stealth air-cooled chillers deliver an industry-leading combination of part-load and full-load efficiencies and the lowest published sound levels for an air-cooled chiller in the heating, ventilation and air conditioning industry. At the core of the Stealth chiller’s performance is AdaptiSpeed™ technology – the integration of a direct-drive, specific-speed screw compressor, permanent-magnet motors and third-generation Trane Adaptive Frequency™ Drive (AFD3). This video was published a while back but it's worth watching again - particularly since modular housing and commercial modular construction have both become popular in the sustainable design and green building arenas. Architects are embracing the sustainable aspects of building in a controlled environment and specifying sustainable materials and owners are taking full advantage of the flexibility and time savings that are inherent to modular building. Consider modular...it has come a long way in the last decade. The U.S. Department of Housing and Urban Development announced today that Wells Fargo Bank N.A., the National Fair Housing Alliance, 13 private fair housing organizations and Acting Assistant Secretary Bryan Greene have reached an agreement through which Wells Fargo will invest in efforts designed to help improve housing in minority neighborhoods that have been hard hit by the foreclosure crisis. As part of the agreement, Wells Fargo has committed to invest a total of $39 million in 45 communities across the country through various programs to support home ownership, neighborhood stabilization, property rehabilitation and housing development. A new U.S. Geological Survey study documents that the Nation's aquifers are being drawn down at an accelerating rate. Groundwater Depletion in the United States (1900-2008) comprehensively evaluates long-term cumulative depletion volumes in 40 separate aquifers (distinct underground water storage areas) in the United States, bringing together reliable information from previous references and from new analyses. 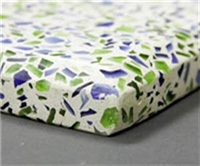 Recycled glass is a sustainable material. mode about green building materials and sustainable design. I will be sharing this video with anyone that inquires about using green building materials for a residential or commercial construction or renovation project. If you are a builder or developer - ask yourself how sustainable your "projects, practices and products" are after watching this segment. This is part 1 of 3 and lasts about eleven minutes. Enjoy and share...and thanks to Michael Amish for a great tool. Part of green building is green landscaping and in this video Professor Doug Tallamy points out some of the most important reasons why specific plants and trees make up a truly sustainable landscape for any building, home or school. It makes sense to landscape with a purpose! DEARBORN, Mich., May 13, 2013 – Ford and the MyEnergi Lifestyle® initiative have kicked off the MyEnergi Lifestyle retrofit contest with Katie Couric on her syndicated talk show “Katie.” Homeowners can enter this national contest for a chance to win a package that includes a Ford C-MAX Energi – America’s most affordable plug-in hybrid vehicle, new Whirlpool brand appliances, a SunPower solar power system and other home products designed to bring energy-efficient living to a typical American family. The contest is now open and runs through June 9, with the grand prize winner to be announced this summer. If you have been following our posts we have been covering Bamboo as a sustainable building product quite a bit lately and this video continues our hunt for more facts, figures and examples of building with this hearty grass. Plus, and it's a big "plus" we are on location and publishing the iBuildgeen Blog from Marbella, Guanacaste, Costa Rica where green building with sustainable materials and eco friendly practices are part and parcel with living in this ecologically supercharged part of the globe.